This reliable and easy-to-operate electronic security system can be used in banks, factories, commercial establishments, houses, etc. The system comprises a monitoring system and several sensing zones. 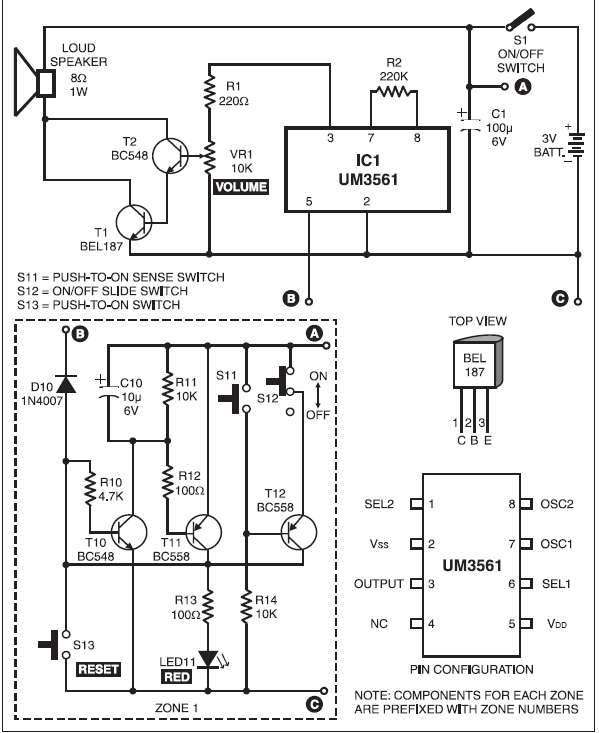 Each sensing zone is provided with a closed-loop switch known as sense switch. Sense switches are fixed on the doors of premises under security and connected to the monitoring system. As long as the doors are closed, sense switches are also closed. The monitoring system can be installed at a convenient central place for easy operation. corresponding points of the alarm circuit (upper half of Fig. 1). the collector voltage of transistor T10 falls to forward bias transistor T11, which conducts and its collector voltage is sustained at a high level. Under this latched condition, sensor switch S11 and the state of transistor T12 have no effect. In this state, red LED11 of the zone remains lit. Simultaneously, the high-level voltage from the collector of transistor T11 via diode D10 is applied to VDD pin 5 of siren sound generator IC1 (UM3561) whose pin 2 is grounded. Resistor R3 connected across pins 7 and 8 of IC1 determines the frequency of the in-built oscillator. As a result, IC1 starts generating the audio signal output at pin 3. The output voltage from IC1 is further amplified by Darlington pair of transistors T1 and T2. The amplified output of the Darlington pair drives the louds peaker whose output volume can be controlled by potentiometer VR1. Capacitor C1 serves as a filter capacitor. You can alter the alarm sound as desired by changing the connections of IC1 as shown in the table. The circuit continues to sound the alarm until zone door is closed (to close switch S11) and the reset switch is pressed momentarily (which causes transistor T10 to cut off, returning the circuit to its initial state). The system operates off a 3V DC battery or recharging battery with charging circuit or battery eliminator. If desired, more operating zones can be added. operation, guarding all the zone doors. Now, if the door of a particular zone is opened, the monitoring system sounds an audible alarm and the LED corresponding to the zone glows to indicate that the door of the zone is open. 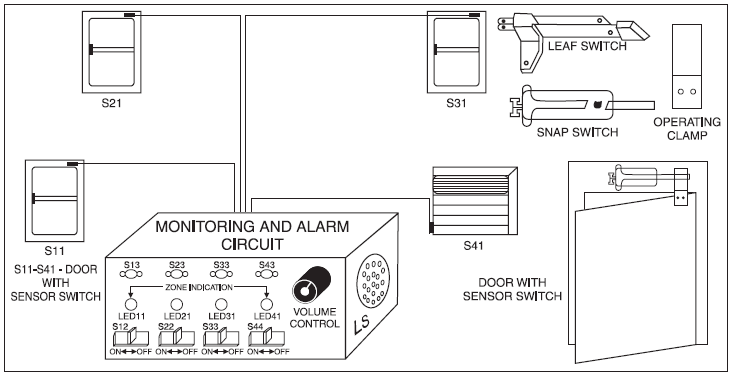 The alarm and the LED indication will continue even after that particular door with the sensing switch is immediately closed, or even if that switch is removed/damaged or connecting wire is cut open. Any particular zone in the monitoring system can be put to operation or out of operation by switching on or switching off the corresponding slide switch in the monitoring system. The circuit for monitoring four zones costs around Rs 400.